Vermont is getting ready for its annual gala event, and of course, you’re invited! The landscape is so stunning, so vibrant, that I have to make a point to watch the road, and only the road, when I’m out and about. It just seems impossible to go about daily life when the natural world is putting on a display that just begs to be photographed. The solution to this beautiful distraction? 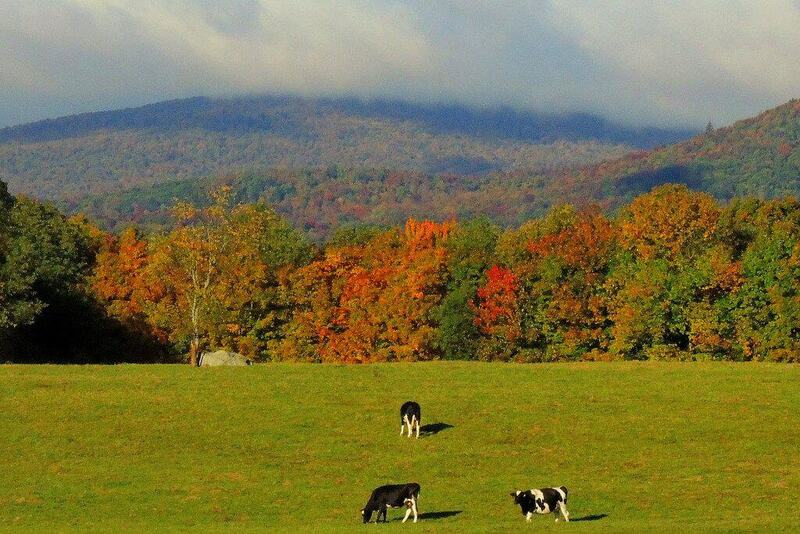 A little southern Vermont weekend getaway, fall-foliage style! If you have two or three days to explore this fall, why not head up to southern Vermont? It’s just a few hours from Boston and New York City – a perfect long-weekend retreat for families, couples, and canines. 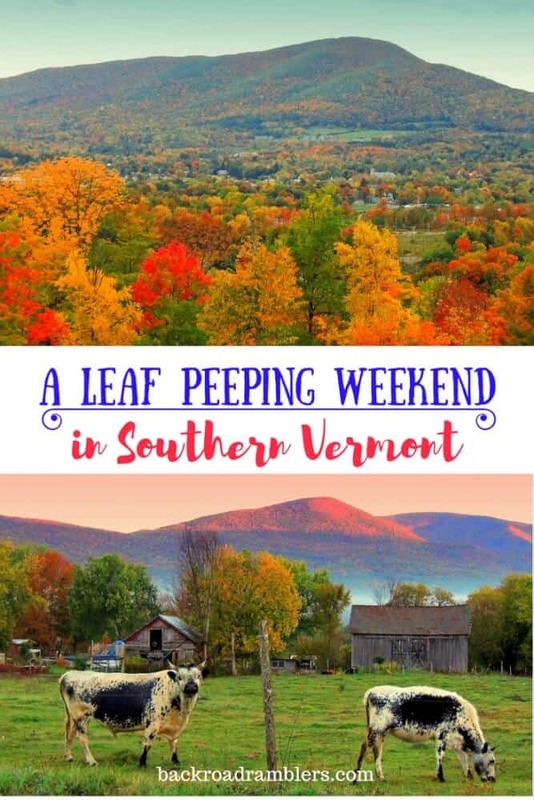 This southern Vermont getaway will give you the perfect opportunity to drive beautiful back roads, explore quaint New England villages, and even do a little camping. Here are the highlights of a three-day trip through the mountains and villages of southern Vermont. Wilmington, VT bustles in all four seasons. In the summer, it’s a mecca for anglers, sailors, hikers, and swimmers, who come to enjoy the cool, clear waters of Lake Whitingham. It’s also home to several swoon-worthy restaurants, a sweet little bookstore, and boutique shopping. In the winter, skiers and boarders flock from all over to hit the slopes of Mount Snow, just a short drive from the center of town. Wilmington was hit hard by Hurricane Irene a few years ago, but it has bounced back and continues to be a destination hot-spot for Vermonters and tourists. Wilmington is one of the first towns I recommend to visitors who are traveling through Vermont because it is a small town in the mountains, and it embraces that classic New England charm. Plus, if you’re an outdoor lover, you’ll find plenty of hiking, not to mention a million different opportunities for taking fall photos. 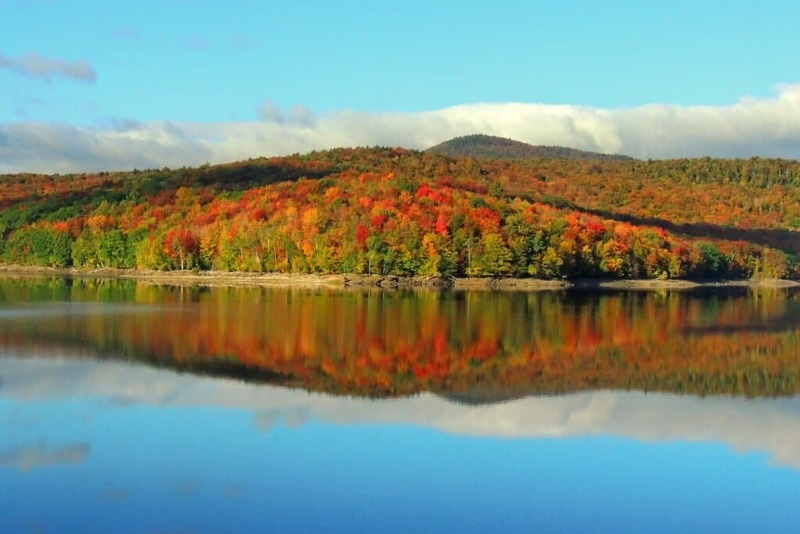 The gorgeous Lake Whitingham, VT – also known as the Harriman Reservoir. Wilmington has plenty of choices when it comes to lodging, but I love staying within walking distance to everything. For the budget-minded traveler, you can’t beat the Viking Motel. It’s dated, but so quaint, and the owners are really friendly. If you’re looking for something more upscale, check out the Crafts Inn, which is kind of luxurious, and super convenient to some of the best restaurants in town. Molly Stark State Park is located just east of Wilmington on route 9. 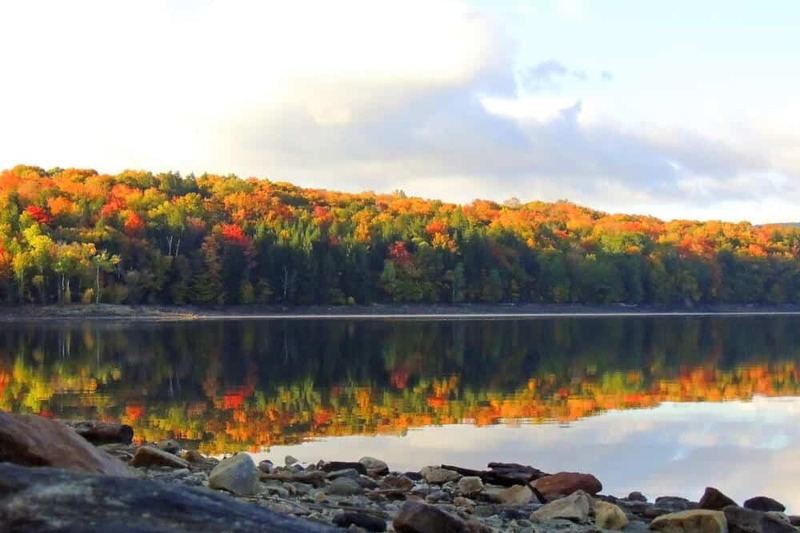 It’s a gorgeous spot for fall camping, and the hike to the top of Mt. Olga is a great one for families. There are 23 tent/rv sites and 11 lean-tos to choose from. The park closes for the season after Columbus Day weekend. Who says awesome barbecue can only be found in the south? If you’re meandering through southern Vermont, you absolutely have to make a detour to eat this world-famous barbecue. 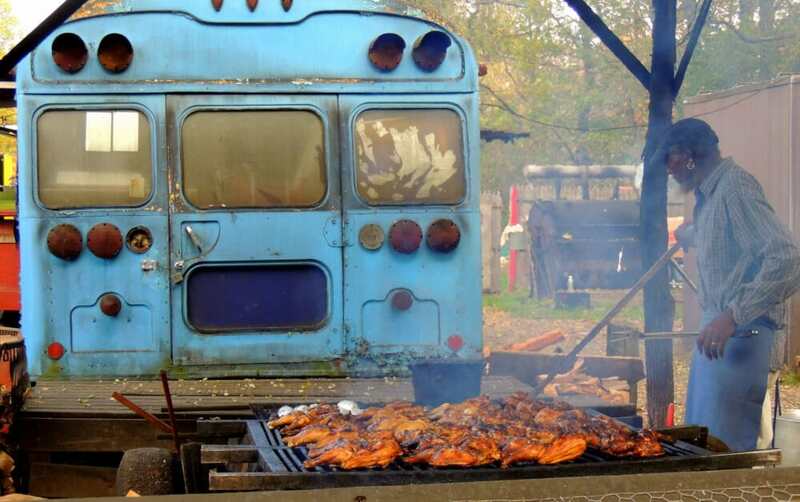 Curtis Barbecue has been a seasonal staple around these parts for more than 35 years. It was featured in the New York Times way back in 1988 as the most awesome back road BBQ in Vermont, and even though I’m a proud vegetarian, my family will happily vouch for this all-American fare. After leaving Putney, drive north on Interstate 91 for about an hour. Get off at exit 9, and drive north on route 12 to Quechee Gorge State Park. This is an awesome spot to take in the fall colors, set up a tent, eat a few s’mores, and drink some beers with friends. 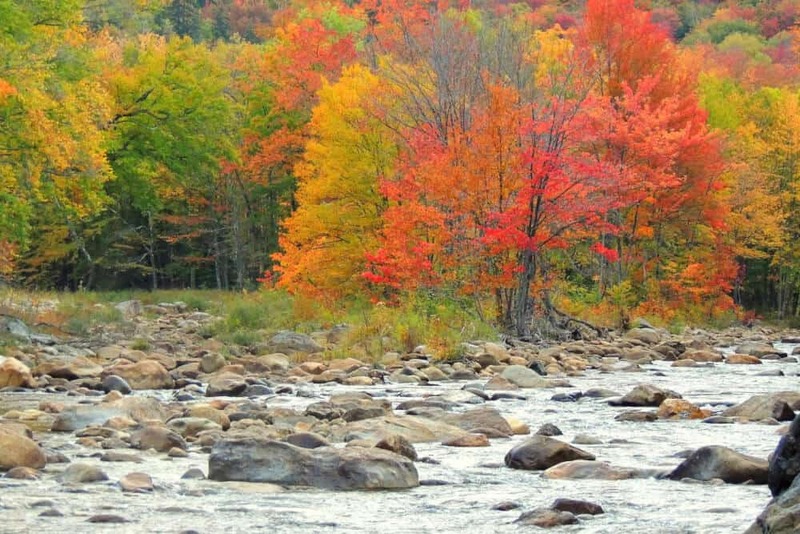 Quechee State Park is nestled in a deep valley east of the Green Mountains. It’s home to Vermont’s deepest gorge and has even been nicknamed the Grand Canyon of Vermont. The gorge was formed by glacial activity some 13,000 years ago, and now it attracts thousands of visitors each year. This shot was taken from the route 4 bridge over the gorge. It’s an iconic shot, taken just as the colors were starting to turn in late September. The view of Quechee Gorge from the Route 4 bridge. 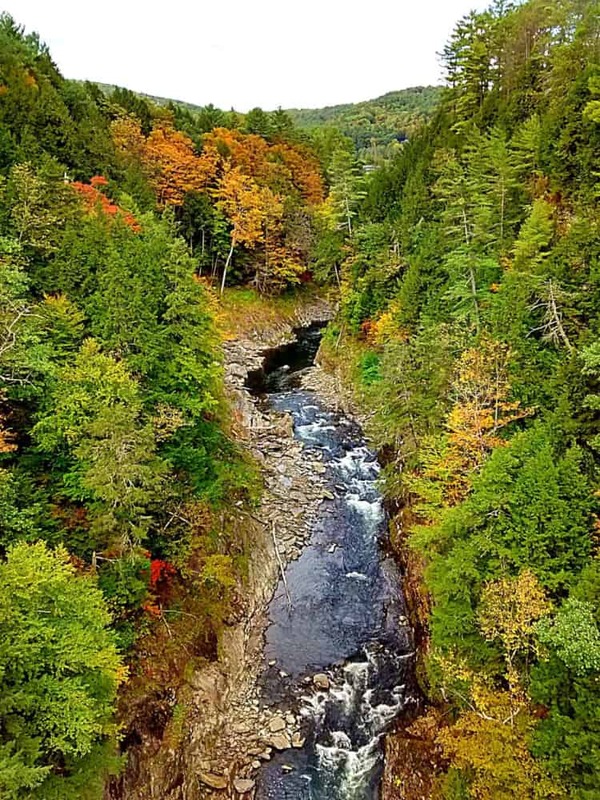 The gorge is pretty impressive, and the park and campground, like every single state park we’ve visited in Vermont, is home to the friendliest staff, the cleanest restrooms, and the most laid-back atmosphere. It’s certainly not wilderness camping — you’re in close proximity to mini-golf, kitschy souvenir shops, and several restaurants, all hoping to cash in on the allure of the gorge. The campground is quiet though, and the hot showers are the best campground showers we’ve experienced. Fall camping can be chilly here, so be sure to pack an extra blanket or two, or you won’t want to get out of your tent in the morning. I think the secret to visiting Quechee Gorge is to get up early as the sun is just waking up. I didn’t see a single human at 7 am, but at noon the place was overrun with visitors. 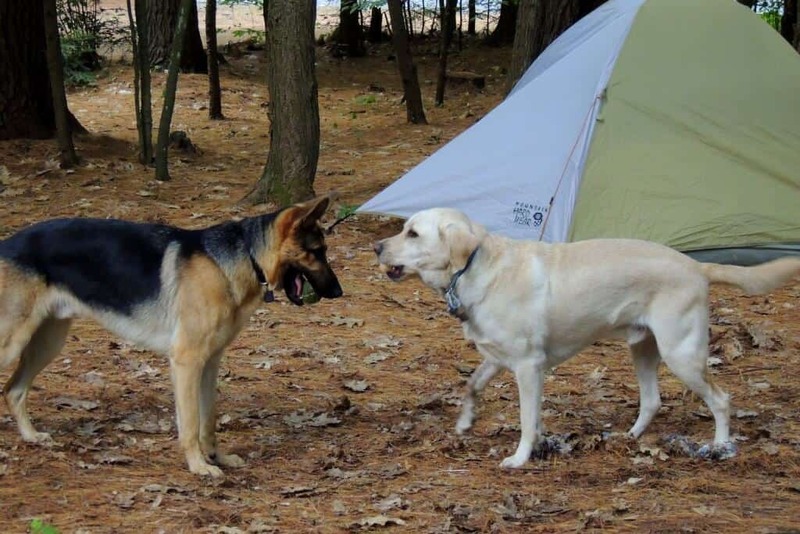 Quechee Gorge State Park is dog friendly! Marsh-Billings-Rockefeller National Historical Park is Vermont’s only national park, and before this year, the last time I visited was so long ago I can’t even remember (I think I was 6). This is a gem of a park, with a working farm, a managed woodland, and a historic mansion and gardens that have been lovingly restored. We visited during peak foliage, and it was REALLY busy, but most tourists were touring Billings Farm & Museum. 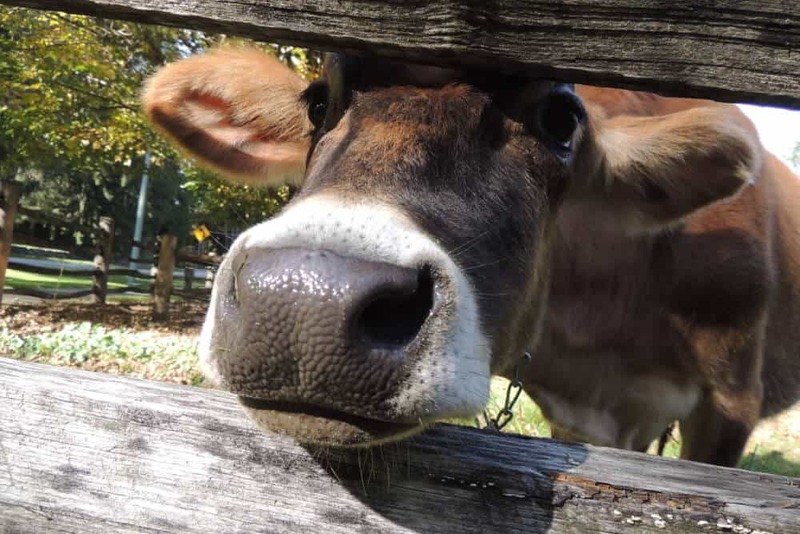 There were horse-drawn carriage tours, cheese-making demonstrations, and guided tours of the farm and mansion. If you’re seeking solitude, head out on the network of more than 20 miles of trails and carriage roads that criss-cross the park. As is the case for most national parks, once you get off the beaten path, you’ll meet nary a soul. This is a managed forest, and if you bring along the trail map, you can learn when each stand of trees was planted. 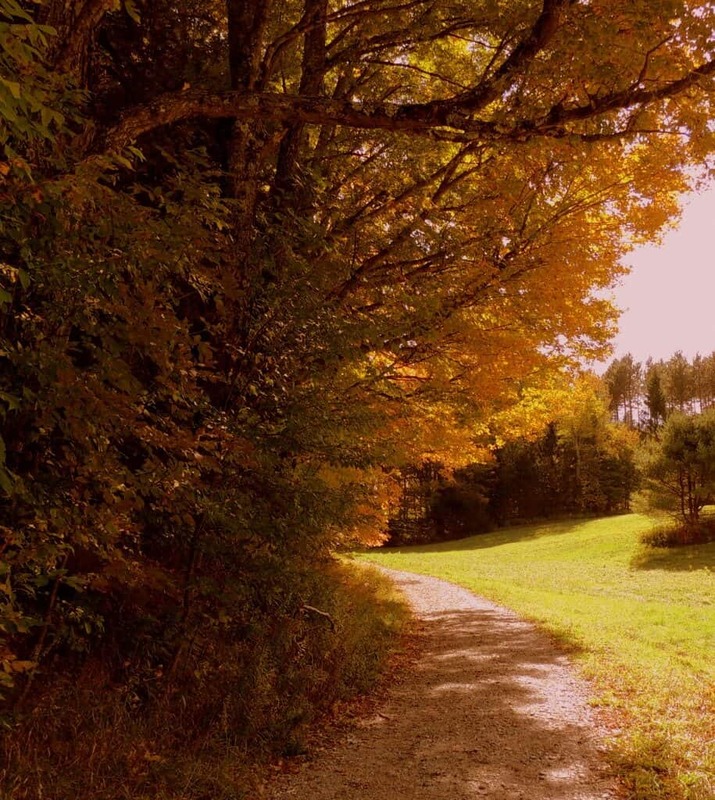 The trails take you through quintessential Vermont landscapes — beautiful meadows, dark pine and hemlock forests, and around picturesque ponds. I recommend giving yourself a full day to explore. 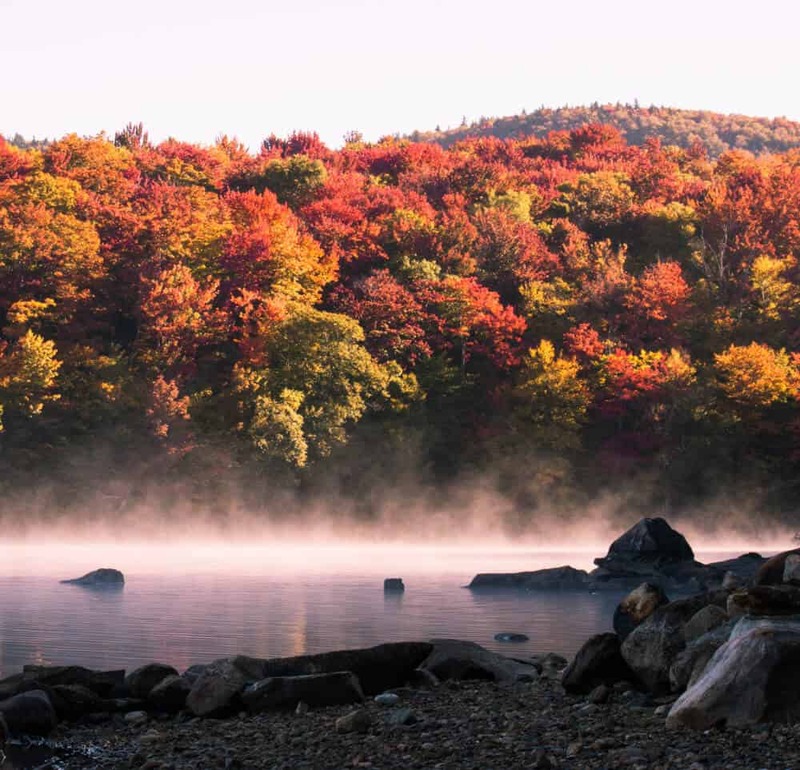 Fall camping is a great way to see the Vermont colors in all their glory, and if you visit on or before Columbus day, you’ll have several southern Vermont campgrounds to choose from. We highly recommend the Vermont State Parks, specifically, Woodford State Park, Molly Stark State Park, or Quechee State Park. You can learn more about tent and cabin camping on the Vermont State Parks website. Camping not your thing? Find the cheapest southern Vermont lodging on Trivago. Want to plan a vacation in Wilmington? The Southern Vermont Deerfield Valley Chamber of Commerce has lots of great information about where to stay, shop, and dine. Want to stay and play in Woodstock? 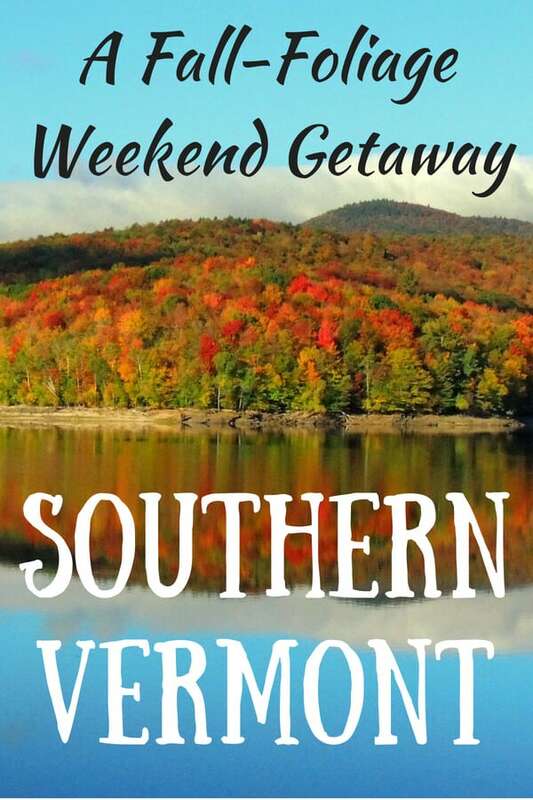 Woodstock, VT for lodging, dining, shopping, and special events. Do you have a favorite spot to explore fall colors? We’d love to hear about them in the comments. Beautiful photos! Living in neighboring NH, we have been to Quechee Gorge and Billings Farm several times with our three kids. 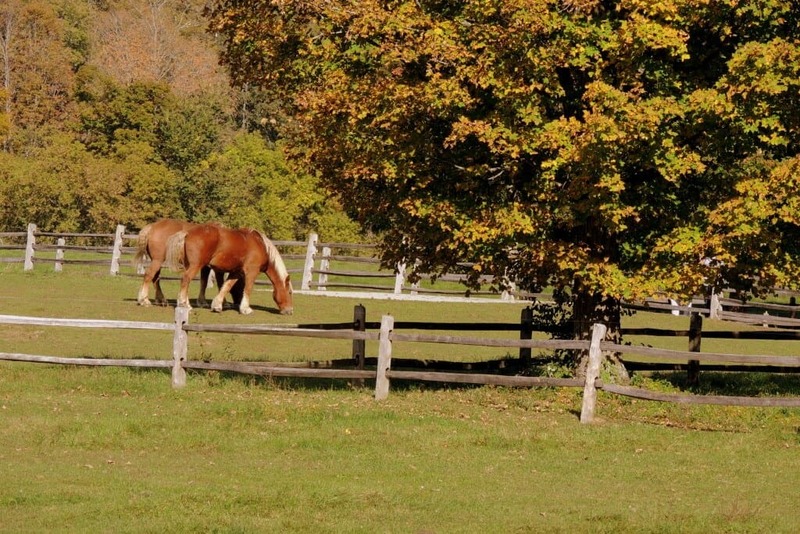 Great outings for a fall day. 🙂 Will have to check out Wilmington! 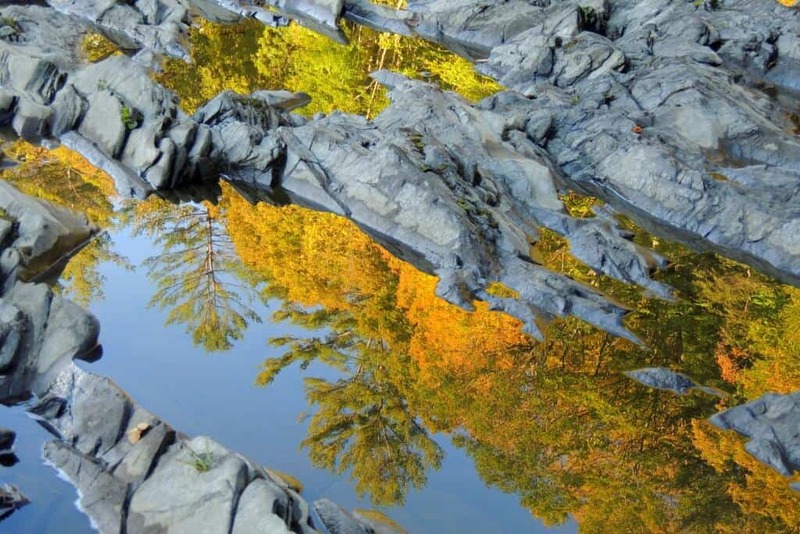 If you liked Billings Farm and Quechee Gorge, I think you will love Wilmington! I’ve never been to Vermont. It looks so lovely, especially in the fall with the leaves changing color. The reflections in the lakes always catch my eye! We love visiting anywhere in Georgia or Wilmington, NC during the Fall. It’s just so beautiful outside; especially for us Floridians! It’s always hot- ALWAYS. Ha! Anyways, hopefully we can connect! Great post. Wow! What an amazing trip! One day I am going to do this, even if I have to drag my husband kicking and screaming. I love fall! Wow, Beautiful! I love the fall season! Beautiful! It makes me want fall all over again! My family always took road trips to enjoy the fall foliage. Living in southern AZ, we don’t get too many colors but when the cacti blooms it can be pretty magical! Thanks for sharing. Meredith – we are heading on our very first trip to Arizona in April. I can’t wait!!! What an absolutely gorgeous collection of photos! You’re so lucky to be living in Vermont at this time of year. The scenery is just beautiful and I loved how you captured the reflection shots. I live in San Diego with not much leaf changing color display at this time so I loved seeing this. The New England area has the best Autumn colors! Thank you, Mary. New England is my favorite place to be in the fall, but I’ll take San Diego in the winter for sure!! What gorgeous photos! I really miss the changing colors that happen in the fall. We don’t get that kind of beautiful color here on the Gulf Coast. I used to take myself off for a weekend at Land Between the Lakes in KY/TN every fall, but it’s been a few years…maybe five…since I’ve been able to do that. I told my husband that we needed to go this year but my shoulder surgery has kinda messed that up a little bit. I’m in love with New England, but the Gulf Coast has its own beauty that I would love to explore more of. Thanks for popping in. I hope your shoulder is healing quickly.